Carly Whiskers and her pony Willow have practiced jumps all summer. They want to win the trophy in the 1st annual Cloverleaf Corners Horse Show. 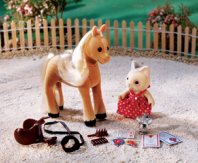 Includes: Carla Whiskers, Willow the Pony, bridle and reins, brush, comb, trophy and awards. Pony and cat sister figure included.